When I set out to visit the Santa Barbara Zoo I had now idea of the interesting animals I’d meet or the wealth of knowledge I’d find. Join me as I take you around the zoo’s last half (first half – From Chatty Swans to the California Trails at the Santa Barbara Zoo) as the Forest’s Edge leads to a Lucky Penguin at the Santa Barbara Zoo. In the Forest’s Edge exhibit you’ll find an animal that’s quite dear to my heart, the gorilla. 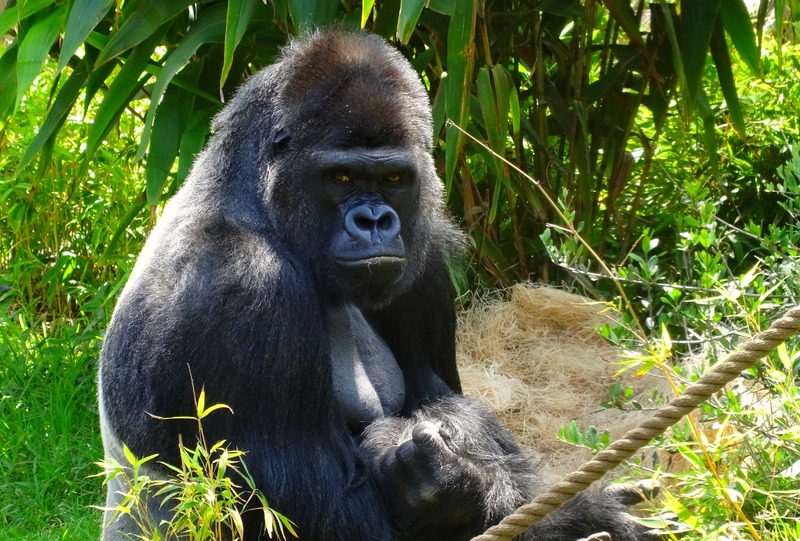 This exhibit is home to the zoo’s bachelor group of Western lowland gorillas. The one male sitting in the middle of the yard seemed to stare at me with his deep, soulful, penetrating eyes, but I couldn’t help but laugh because he looked so serious. My love for gorillas goes back to my childhood when I first watched and learned of Dian Fossey and her work with the critically endangered mountain gorillas and really propelled my love and desire to work with and for these amazing animals and help do my part to save them. Though I haven’t found a zoo that houses mountain gorillas it just might mean I must go to the jungles of Africa to see them in the wild! From the Forest’s Edge to the African Veldt that covers over an acre and is home to giraffes, east African crowned cranes, African spurred tortoise and the slender-tailed meerkats. One of the highlights of the day, and a great experience to be had, was feeding their giraffe feeding. 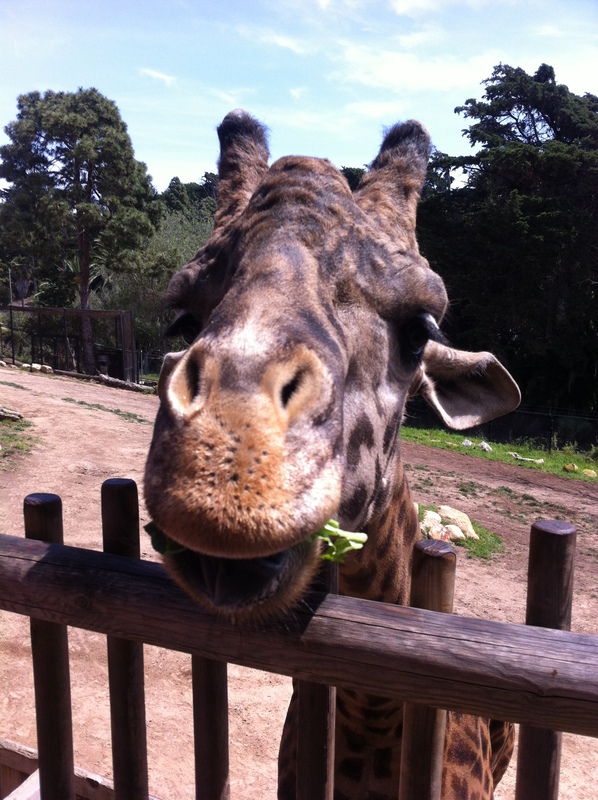 For a few dollars you can get up close and feed a giraffe some juicy lettuce. These remarkable animals are beloved by many for their tall, statuesque and noble look but sadly many sub-species of giraffe are endangered. 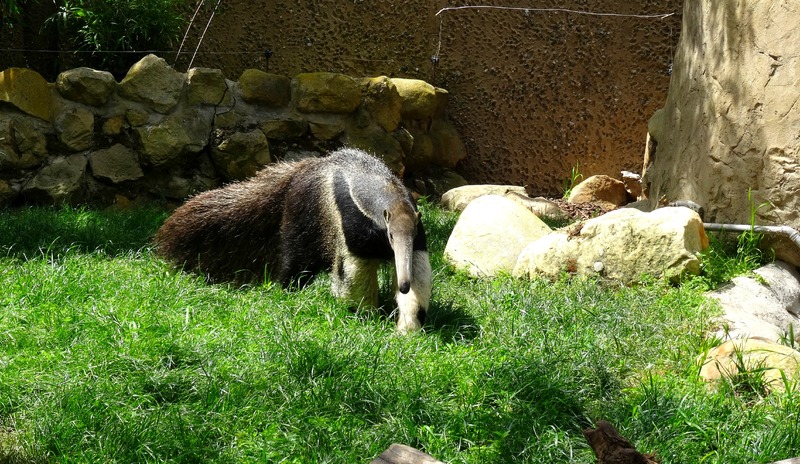 Here at the Santa Barbara Zoo you’ll meet Mike, the adult male of the herd. Mike has some of the purest DNA of giraffes in North American zoos and at 16 feet tall and a whopping 2,000 pounds his charm will capture your heart. It’s truly an amazing experience to encounter a majestic beast like this close at hand and have the opportunity to feed it, it’s also a great chance to see just how long their tongue really is, a foot long. Their long tongues combined with the long necks allow them to feed easily off of tall acacia trees and their tongues are quite hearty to attempt this prickly feat thanks to its extra tough exterior. At the time of my visit the zoo had recently welcomed two new baby giraffes who were out romping around in the California sunshine. One caught my eye as it had its tongue hanging haphazardly out of its mouth and when I enquired I learned it was a strange trait passed down from its mother who also does the same thing. They certainly have a quirky bunch of giraffes that are clearly much loved. Next door, keeping quite the watchful eye on the giraffe herd were same beautiful lionesses and though he wasn’t on display the male was certainly letting everyone know he was around by letting out the occasional roar which surprised and stunned many visitors. If you’ve never heard or even if you have heard an adult male lion roar, it is an astonishing sound that can be heard from miles around and rumbles your bones, and to me sounds like Africa calling to me every time. The penguin exhibit was next and home to Humbolt penguins who are found along the Pacific coast of South America from Peru to Chile. This state of the art exhibit has nesting caves and underwater viewing to watch these agile birds fly through the water. It was here that I meet the most fascinating and memorable animal from my west coast adventure, Lucky. Lucky is a four-year-old Humbolt penguin who hatched at the zoo but keepers soon after realized he had a limp, vets determined it was a problem with the growth of his foot bone and it was decided that he would need assistance to walk with the aid of a shoe of some sort. 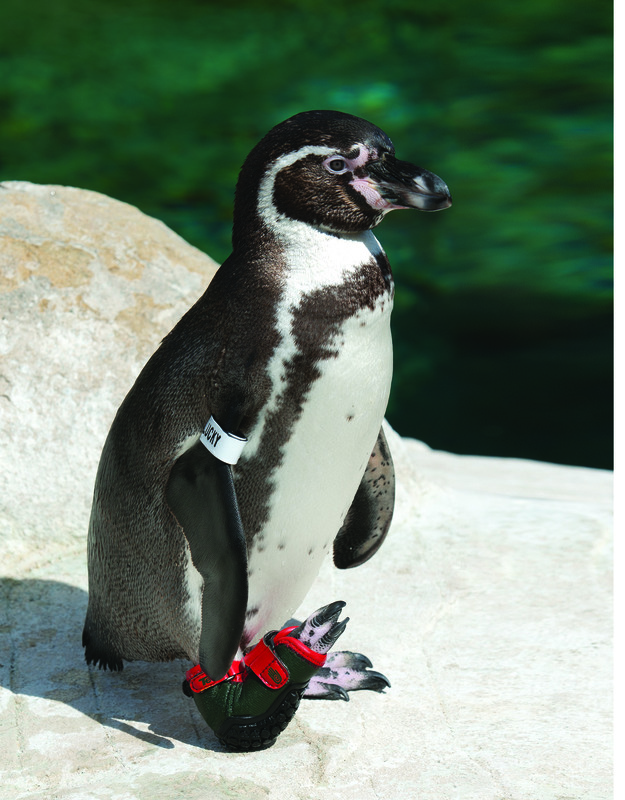 Amazingly with the help of Teva, a shoe company, who created a custom shoe for Lucky and has committed to for his life, he can now walk, hop and swim like the rest of the penguins. Lucky certainly is lucky to have such dedicated keepers and the help of a big time brand like Teva and has touched the hearts of many, including mine! From cute penguins to the perhaps not so cute but still quite fascinating, bug, snakes, lizards and more found in the cave of ‘Eww! Hair-Raising Helpers from Around the World’. 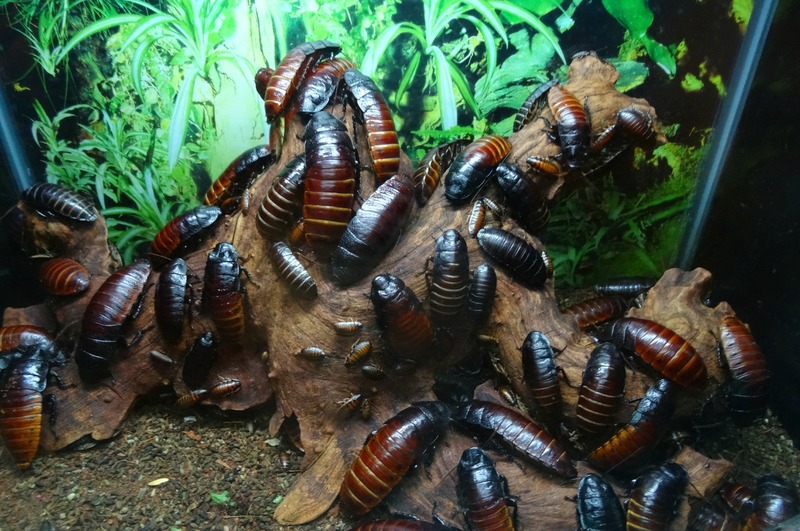 Here you’ll find creatures from Central America to the American south-west and Africa to south-east Asia. Many people loath them, some have a debilitating fear of them but the rest of us understand their need and are even amazed and intrigued by them, but truth be told these creatures outnumber us 2,000,000 to 1 and have big jobs to do. Bugs play an integral part in the ecosystem from spiders eating other bugs to dung beetles getting rid of waste and honestly fruit, vegetables, herbs and flowers wouldn’t be here without the hard work of bees and butterflies. Here I met geckos stuck to the glass showing off, a Colorado river toad at the glass to say hello and a beautiful Taylor’s cantil snake. 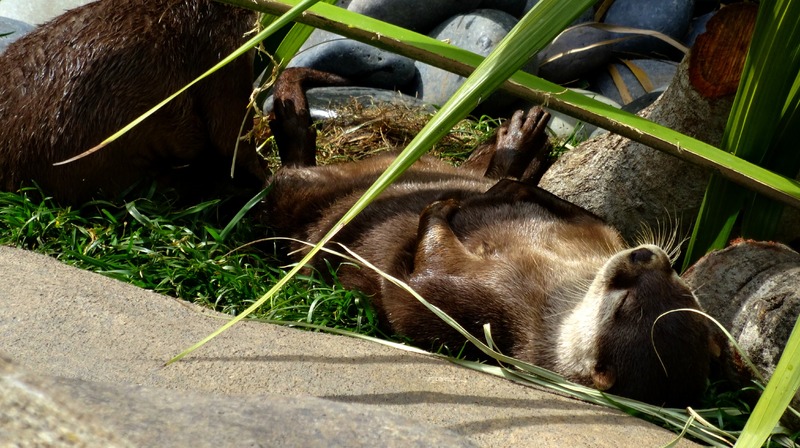 And as I made my way back to the front to leave I was thrilled to find another exhibit full of sweet and playful otters. They were swimming and slinking around, in and out of the water, two chasing each other, it was a sight that always fills me with pure joy. There’s something innocent and endearing about otters, they always seem so happy, like they don’t have a care in the world. Strangely I always try my best to get a still shot of them but they’re always so fast and constantly on the move but I caught a brake at the Santa Barbara Zoo, they started to settle and ready for a siesta and then I hit the jackpot and I couldn’t have been happier when I finally caught a shot of one laying on his back, belly up – TOO CUTE! I absolutely fell in love with the Santa Barbara Zoo and it’s sweet and charming animals. It just goes to prove great things come in small packages!